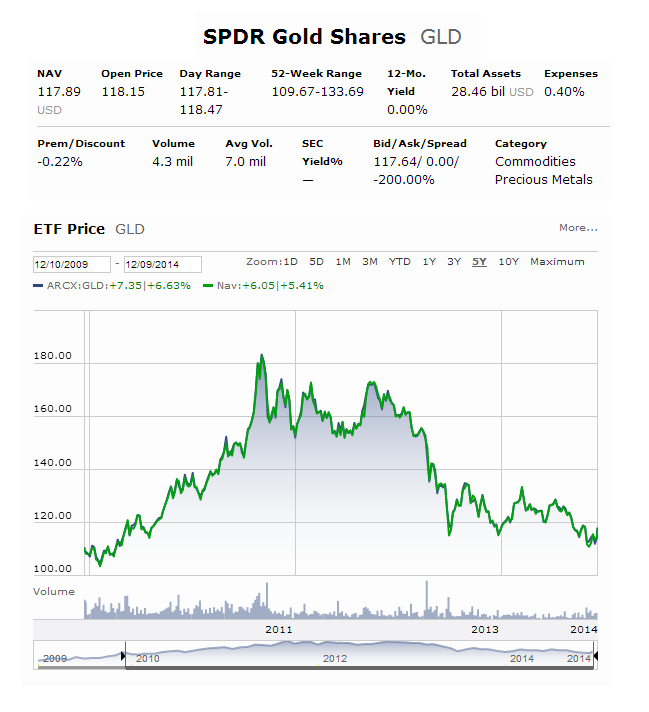 SPDR Gold Shares ETF (GLD) is an exchange traded fund investing in gold. SPDR Gold Shares (GLD) offer investors an innovative, relatively cost efficient and secure way to access the gold market. This commodity ETF is originally listed on the New York Stock Exchange in November of 2004. It is traded on NYSE Arca since December 13, 2007. SPDR Gold Shares is the largest physically backed gold exchange traded fund (ETF) in the world. This precious metals ETF has no yield. The current expense ratio fee is 0.40% per year. The trust holds gold, and is expected to issue baskets in exchange for deposits of gold, and to distribute gold in connection with redemption of baskets. The total net assets are $28.46 billion. The top holding in this ETF is Physical Gold Bullion (100%). This ETF is available to many investors around the world such as USA, Mexico, Singapore, Japan, and Hong Kong. Using this ETF, investor can invest in gold bullion easily. SPDR Gold Shares can be used as an alternative option to invest in gold commodity.